“Pennsylvania Auto Dealers’ Exchange,” 1958, by Guy V. Glatfelter, stepfather of P.A.D.E’s Co-Founder, Jacob B. Hershey. Depicted in calling on the block are, left to right, Alvin Miller, auctioneer; Charles M. Bachman, auctioneer; and Hershey. 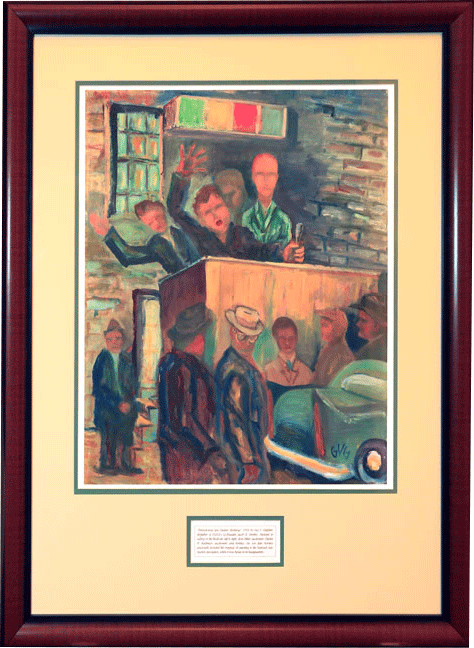 His son Jake Hershey graciously donated the original oil painting to the National Auto Auction Association, where it now hangs in its headquarters. Contact: Tricia Heon at theon@naaa.com for print request details.